A day after Lok Sabha Speaker Somnath Chatterjee stated that he was against the interference of courts in Parliament’s decision of expelling 11 MPs for their “involvement” in the “cash for query” scam, the Delhi High Court today issued notices to the Lok Sabha and the Rajya Sabha on eight MPs’ petitions, challenging their expulsion. The CBI today booked K. Siva Prasad, a Punjab cadre IAS officer, who was on deputation with the Food Corporation of India (FCI), in a corruption case. Should there be Jan Adalat (public courts) for open trial of criminals? Blaming Congress President Sonia Gandhi directly for the alleged tapping of the telephones of Samajwadi Party leaders Mulayam Singh Yadav and Amar Singh, a petition has been filed in the Supreme Court by the latter for a judicial probe into the matter and prosecution of those found guilty. 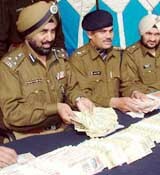 The police has arrested Jagtar Singh and his two accomplices from Phillaur for possessing fake currency worth Rs 45 lakh. Earlier also they were arrested with counterfeit currency worth Rs 4.72 lakh on January 1, 2004 but the accused was out on bail in the ongoing case and was arrested again. Freezing cold wave conditions, prevailing in many parts of north-west India for the past fortnight, continued today without any let-up as the mercury hovered six degrees below normal in Punjab and Delhi. The controversy over eviction of Sikh and Punjabi farmers in Udham Singh Nagar, Uttaranchal, ended late in the evening today following a compromise thrashed out at an emergency high-level meeting. If a judicial probe can be ordered in the oil-for-food programme following disclosures by Volcker, why not in the phone tapping case. The Secretary-General of the South Asian Free Media Association, Mr Imtiaz Alam, today gave a new meaning to the fast-changing India-Pakistan relationship. “The Algebra of Infinite Justice”, a collection of essays by writer Arundhati Roy on the hubris of the rich and the powerful and the plight of the poor and the homeless, was today selected for the 2005 Sahitya Akademi Award in English.